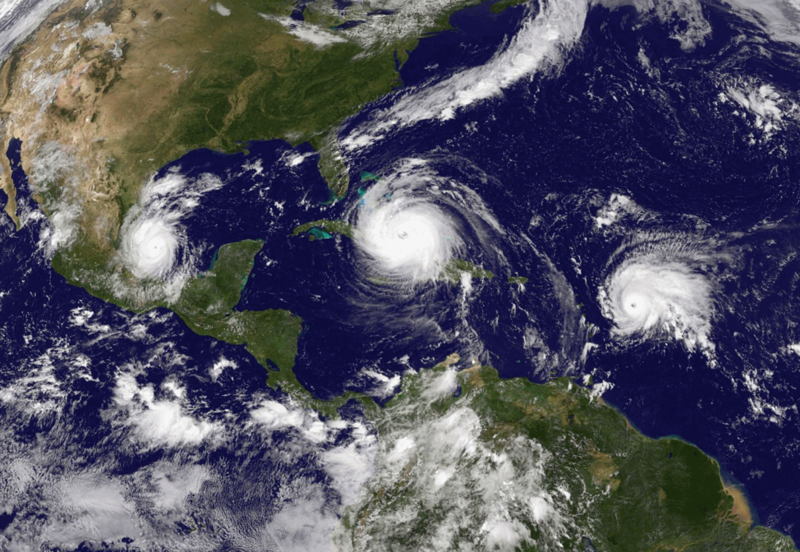 Meteorologists track storms of all shapes and sizes, but there is nothing quite as awe-inspiring and destructive as a major landfalling hurricane. These Texas-size whirlwinds of trouble produce a weather-trifecta of risk: storm surge, high winds, and inland flooding. Called typhoons in the western Pacific and cyclones in the Indian Ocean, they are identical in structure and formation; drawing warmth from the oceans and converting it into raging spiral bands of shrieking winds and blinding rain. The lighter the winds aloft and warmer the seas, the greater the potential for a cluster of thunderstorms to strengthen into a depression, tropical storm or hurricane. As a profession, meteorologists and their weather models do a better job predicting hurricane track than intensity. The USA is still the only nation on Earth that flies NOAA “Hurricane Hunter” aircraft into the heart of these raging weather-beasts, but today satellites and drones supplement these manned flights, providing critical data necessary to predict their eventual path and strength. 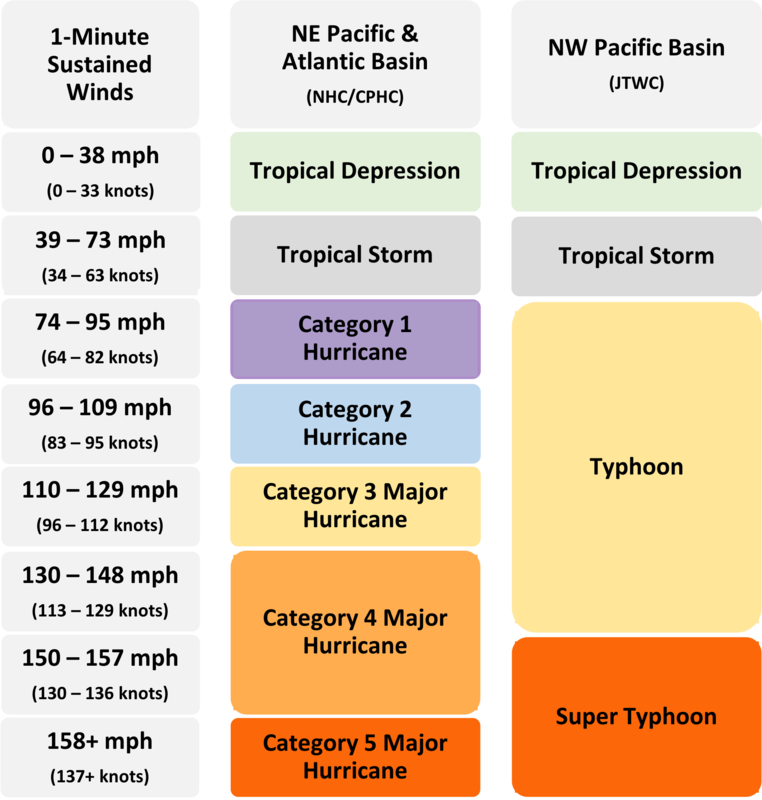 Tropical Storm Classifications. The longer the path or “runway” a hurricane sustains over warm ocean water, the greater the potential for intensification. Sustained winds over 111 mph are considered “major” hurricanes, capable of devastating damage. On rare conditions sustained winds around the relatively calm eye can reach speeds as high as 150-200 mph, with higher gusts. Category 5 storms (called “Super Typhoons” in the western Pacific basin) can scour well-constructed buildings off their foundations – from a “storm surge” of water 20 feet above normal high tide. Unlike tornadoes, hurricanes seem to serve a purpose in nature, transporting excess heat away from the equator and toward the poles. They are, in effect, nature’s automatic “pressure relief valves”. Which might be easier to rationalize if people didn’t build live and work near the ocean. Coastal development continues to accelerate, putting more people and businesses at risk. The National Ocean Service estimates that more than 1,540 American single-family housing units are permitted for construction every day in coastal counties. According to the 2010 census, 39 percent of the U.S. population is concentrated in counties and parishes with direct coastline access. That’s over 120 million Americans living within Hurricane Alley. Hurricane Harvey. 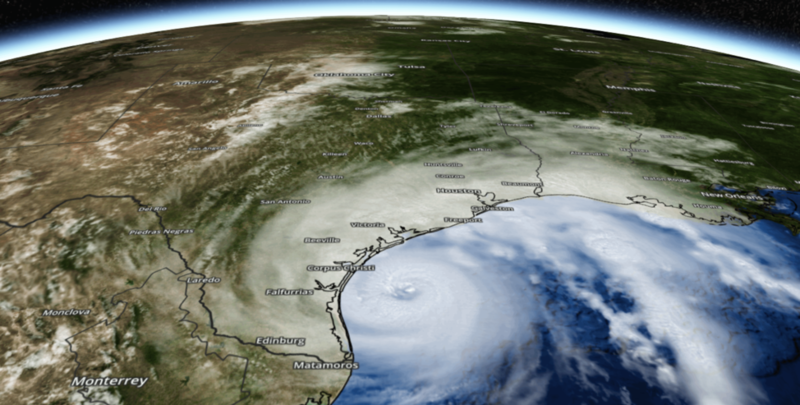 In late August 2017 Hurricane Harvey stalled over coastal Texas for the better part of 5 days, drenching much of the Houston area with over 50” of rain, with as much as 65” reported near Port Arthur, Texas. The result was catastrophic flooding, inundating hundreds of thousands of homes, displacing more than 30,000 local residents. It was the wettest tropical cyclone on record for the United States. Harvey was a stark reminder of the perils of inland flooding days, even weeks after a storm reaches land – with disruptive impacts many hundreds of miles inland. Hurricane Maria. Just 3 weeks later, during the 3rdweek of September 2017, Hurricane Maria devastated numerous island nations in the Caribbean; the worst natural disaster on record for Puerto Rico and Dominica. Maria was the thirteenth named storm, the eighth consecutive hurricane, fourth major hurricane, second Category 5 hurricane, and the deadliest storm of a hyperactive 2017 Atlantic hurricane season. With peak sustained Category 5 winds of 175 mph in the eastern Caribbean, Maria went on to strike Puerto Rico as a Category 4 storm, producing a death toll now estimated in excess of 1,000 people. The total damage toll from Maria may have approached $100 billion, making it the third-costliest tropical cyclone on record. Overall 2017 was the costliest season on record, surpassing the previous record holder, the 2005 season. According to a summary at Wikipedia, more than 99.7 percent of the season’s damage was due to three of the season’s major hurricanes – Harvey, Irma, and Maria. Tropical Storm Awareness. Today, with legacy media, internet, social media, and weather apps we are drowning in weather information. But trusted sources can be confused with weather-hype, rumor, and false alarms, creating confusion and lost productivity. Progressive, forward-looking businesses, however, are refocusing their supply chains, optimizing their transportation logistics and prioritizing risk mitigation by subscribing to AerisWeather API datasets that personalize the threat for specific use cases. Whether its’ big box retailers prepositioning building supplies in counties most threatened by damaging winds and waves or local utilities mapping the predicted damage path to minimize outages at the height of the storm, a wide variety of industries are better prepared than ever before. Tropical Storm API endpoint data and graphical AMP maps from AerisWeather display, in real-time, the latest observations, tracks, and forecasts – tailored for a company’s specific usage needs and risk-footprint. Insurance companies overlay landfall projections with demographic and mortgage data to assess risk and dispatch claims personnel. Geo-fencing allows insurance clients impacted by hurricane wind and flood damage to receive materials and links to better understand their coverage and file claims. Travel companies can up-sell travel insurance, based on city location, data, and historical data that plots previous storms within a specified radius. Health providers can disseminate notifications of relief center locations to those affected and leverage geo-coordinates within these alerts to determine who is most at risk of life-threatening medical ailments, during and after the storm. Emergency managers integrate storm data to deploy and optimize resources for search and recovery. Free weather apps are the rough informational-equivalent of fast food. At the end of the day, they don’t quite get the job done. By levering AerisWeather API and graphical (AMP) data streams, companies personalize tropical storm information for their operations; optimizing and streamlining data to power their business models – saving money, avoiding disruption, and lowering the risk of subsequent injury and dislocation for staff, vendors and customers alike. Don’t gamble with heavy weather. Take steps to better prepare for the next inevitable hurricane landfall. Learn how user-friendly, cost-effect data streams and maps from AerisWeather can protect capital and keep the lights on – no matter what Mother Nature throws at you. – Check out our API documentation and AMP Layers.